Chakte Kok wood inlaid Titanium, created with a beautiful warm redwood, perfect for jewellery. Crafted from 7mm wide precision engineered Titanium, encased in a Redheart inlay 4mm wide. 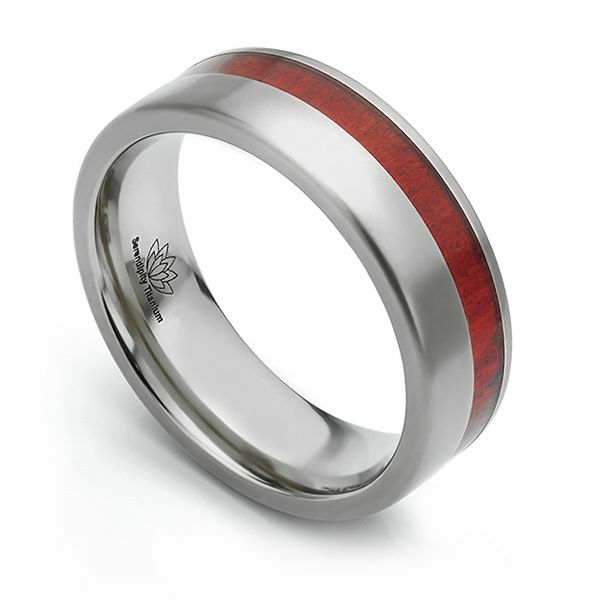 The Chakte Kok wood inlaid Wedding Ring is crafted from precision engineered Titanium. Created in a 7mm width, the ring features an offset inlay of red wood, otherwise known as Chakte Kok. This buttery smooth wood reveals a rich red colouration with subtle black detail. Your ring will be crafted to order over a timescale of 3-4 weeks before it is delivered to your door within beautiful Serendipity Diamonds packaging. Please ensure the correct finger size is ordered. We provide a free ring sizer and have a selection of loan ring size examples available to double check your size ahead of placing the final order. See the button below to check your correct finger size.